There is no question in my mind that Italy’s NIBIRU is one of extreme music’s more cataclysmic entities, their ability to construct seemingly inhuman sonics laden with esoteric themes is second to none. The band’s audio borne doctrines of magnanimous philosophical contents, both musically and lyrically, are delivered by out of this world means. 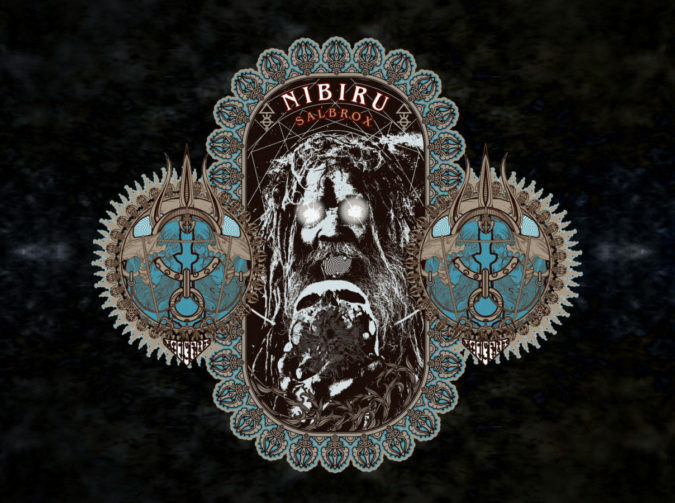 Melding lethal amounts of massive doom and blackened sludge, with engrossing atmospheric textures and psychedelia, NIBIRU expertly wield a comprehensive artistry all their own. Augmented with such additives as tribal percussion, evocative mantras, and hypnotic drone elements, this is music with the means to alter one’s consciousness. Today, we share news that on May 10th NIBIRU will unleash their fifth full-length recording, ‘Salbrox‘, the first outing for Ritual Productions. With the announcement and accompanying album details, the unveiling of the band’s stunning, transcendental visual treatment for one of its tracks, “EXARP“, is presented as well. The video is a truly mind altering exploration of dissonant aural variations, the viewing listener becoming transfixed by fascinating ocular components, while wave upon wave of decimating sound output bombards them. It was directed by Marco Testa, and includes artwork courtesy of VALNOIR | METASTAZIS. Over the span of their collective studio albums, NIBIRU have journeyed quite far upon an expedition to delve ever further into self-awareness. With their latest voyage, we find the foundations of ‘Salbrox‘ rooted in the alchemical practice of “Solve et Coagula” (to dissolve and coagulate), and it follows the key principles of alchemy – merging deep, ancestral knowledge into an all-encompassing dispersal of purifying sound. ‘Salbrox‘ was recorded live and mixed at Music Lab Studio, Italy by Emiliano Pilloni, mastered at Audiosiege by Brad Boatright, and produced by NIBIRU. It will be released May 10th via Ritual Productions.